The SLFP yesterday denied any rift between President Maithripala Sirisena and Prime Minister Ranil Wickremesinghe, in an attempt to quell rumours after the President’s public outburst against the CID, FCID and CIABOC. Addressing the media at the party headquarters in Colombo, SLFP Treasurer and Minister of Social Empowerment and Welfare S. B. Dissanayake said a section of parliamentarians including the members of the Joint Opposition was dreaming of forming a government by next April, but nobody could topple the present regime. "There is no problem between the President and Prime Minister though the Joine Opposition was jubilant," he said, adding that the government would continue. 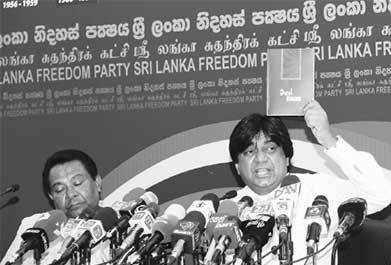 Dissanayake said that President had issued a statement regarding the functioning of the CID, FCID and CIABOC to clear the misunderstanding that the President was involved in a witch hunt against his opponents and responsible for having them summoned by the CID, FCID and the CIABOC. He said President Sirisena did not interfere in the functions of those independent bodies. Dissanayake said they joined the government after former President Mahinda Rajapaksa had handed over the SLFP leadership to President Sirisena and it would not fall until its term was completed. SLFP Spokesman and State Minister of Highways Dilan Perera said a faction of the UNP dreaming of UNP government without the SLFP and the JO were extremely happy. Perera said that although MP Kumara Welgama opposed the forming of a national unity government, no one in the Central Committee, Executive Committee or the All Island Committee of the SLFP had protested against handing over SLFP leadership to President Sirisena. "But now SLFP members in the Joint Opposition say they cannot accept President Sirisena as the party leader," the state minister added. Minister of Disaster Management Anura Priyadarshana Yapa also addressed the media.